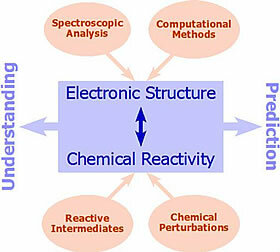 Our research centres on exploring the relationship between electronic structure and reactivity in chemical systems; emphasis is placed on using spectroscopy to define electronic structure and probe reactivity. X-ray spectroscopy figures prominently in our arsenal but other methods are also used wherever applicable to assist in determining the electronic and geometric structure of important catalytic intermediates. For example, magnetic resonance methods such as EPR/ENDOR play a critical role in characterizing paramagnetic species. Take a look at the range of projects undertaken by students in the Kennepohl Group; we have interests in a lot of different areas!